London's world famous Oxford Street, is one of the busiest shopping streets in the world, and attracts millions of people all over the world year upon year. Just like many other shopping streets and districts, worldwide, Oxford Street has been hit by the huge explosion in online shopping, meaning that some shops and businesses are moving their operations elsewhere. From its most easterly point at the junction of Tottenham Court Road, to its most westerly point at the junction of Park Lane Oxford Street is 1.3 miles from end to end. When driving from east to west in a taxi, there are 17 driveable turnings on the northern side of the road, of which 4 have a right turn available. On the southern side of the road therr are 13 driveable streets of which 5 can be accessed via a left turn when travelling east to west. There are 4 underground stations accessible to shoppers in Oxford Street along its entire length, hundreds of buses available throughout the day, as well as a very heavy licensed London taxi presence, which includes a number of taxi ranks on Oxford Street itself, between its most westerly point and Oxford Circus. All other motor vehicles are excluded from Oxford Street between 7am and 7pm Monday to Friday, with the exception of motor cycles. Oxford Street has a very vibrant public transport network, and it works surprisingly well, if you can disregard the lack of enforcement surrounding the exclusion of motor vehicles throughout the day and a bus network which has far too many empty buses. Obviously pollution is high along the entire stretch of Oxford Street, however this is due to several mitigating factors. Starting with the most obvious target, deisel vehicles contribute to a considerable level of pollution, ergo taxis come straight into any given governmental figure, council representative, or statisticians cross-hairs. It is a fact that a slow moving or non-moving vehicle will pump put more noxious gases than a free-moving vehicle, so therefore we have to look at other factors. The amount of empty or near empty buses taking up road-space is quite frankly incredible, why this has never been tackled is a complete mystery. Despite the availability of buses, it is surprisingly awkward to actually pay for one if you are not from London or unfamiliar with the public transport system, with people being caught out, not being able to pay with cash when boarding a bus. Empty or near empty buses take up road space, consequently by default they will slow other traffic down, and as a result pollution increases. Next we have a traffic light "gating" system which jas never worked efficiently. The traffic lights have been intermittently tinkered and toyed with, ultimately to nobody's satisfaction, thus slowing traffic down even further. Finally, we have sheer bad road planning and management,. Taxi drivers and bus drivers, being the predominant users of Oxford Street's road-space, can all see where the problems lay, and yet when issues are highlighted, they are seemingly brushed aside, on many occasions without reason. 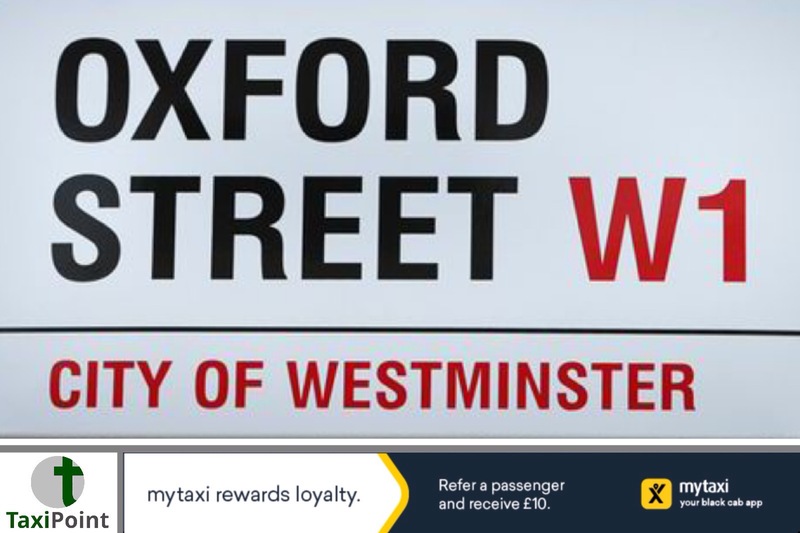 The latest abomination to befall Oxford Street is the ban on taxis turning right from Oxford Street into Portman Street, and turning it into a right turn for buses only. There is no logical reason for allowing one form of public transport to turn right, whilst excluding another form of public tramsport. There have been many theories as to why a no right turn is being put in place, although nobody seems to have put forward an official reason as yet. This has prompted the Independent Taxi Alliance (ITA) to call for a series of protests at a number of locations, where similar taxi exclusions have taken place. Onviously there will be the usual wailing and gnashing of teeth from certain quarters within local government condemning this action, but the ITA have a very valid point in that the taxi industry is part of the public transport network, in fact this was highlighted by the Mayor himself, and as such, should be afforded the same road access as other forms of public transport. What has also been highlighted by the ITA is the fact that while, as an example, bus drivers are paid a wage, regardless of any road conditions, taxi drivers are self-employed entities, who rely on the freedom of movement to be able to work and earn a living. The situation at Oxford Street and Portman Street is not a one off, a prime example is the completely ludicrous taxi exclusion at Bank Junction, an exclusion which seemingly nobody agrees with unless you are a cyclist. When you combine the Bank Junction exclusion with the plethora of roadworks in the same area, the end result is gridlock, and yet the Corproration of London seem to be completely oblivious to the situation. This therefore begs the question as to whether it is any wonder that the ITA have called for a series of protests. The issues surrounding taxi exclusions in London has reached an intolerable level, and although there may be dialogue between local authorities and representatives of the licensed London taxi industry in trying to resolve these problems , there seems to be a fair argument for highlighting the situation.